This DVD introduces you to the best birdwatching sites in northern Spain and gives you a real ‘feel’ for what it’s like to go there. The best sites - covers all the best-known birding sites from the Picos de Europa to the plains of Lleida, including the Spanish Pyrenees around Jaca, the Sierra de Guara, Gallocanta, Villafafila and Belchite. The best information – find out more about the sites and their birds, including what to listen for, to help you find more species. 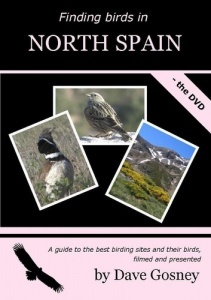 If you’re planning to visit northern Spain in search of birds, this DVD will show you what the best places are really like and introduce you to many of the most exciting species such as bustards, vultures and wallcreepers.